Are ants becoming a problem with your Queen Creek, Arizona home? It’s more common than you think. Ants can become a serious issue inside and outside your home and can be especially difficult to get rid of. If you’re seeing any kind of ant, including small black ants, fire ants, pharaoh ants, or any other ant, there are methods to getting rid of them before calling a pest exterminator in Queen Creek. However, ants are resilient little freeloaders, and sometimes the following approaches are not enough. Luckily, Varsity Termite and Pest Control is available to take care of your pest problem when all do it yourself methods have failed. Ants, like many insects and pest, are attracted to an area because of food. Before employing the following do it yourself ant killing techniques, try giving your house a deep cleaning. Look behind couches, behind the fridges, in the corners of cabinets, and the corners of your kitchen floor for bits of food and crumbs that remain. Also be conscious of cleaning dishes immediately insteading of leaving them out and attracting ants. Another good tip for preventing an ant infestation is to look for where they may be coming in from. Check for holes in your walls, cracks in your doors, and the sealing around doors and windows. Taking care of these entrances can help prevent ants from intruding into your space. Ants may be powerful in numbers, but they aren’t very smart. You can create your own ant poison and bait made from peanut butter, honey, and deadly ant poison boric acid. Lead little bits of the mixture near areas where your see ants foraging or congregating. The ants will eat the mixture, poison and everything, then bring back bits of the mixture to the colony’s queen to eat. This method ensures that not only are the ants you’re seeing going to be exterminated, but the source of the ants will be exterminated as well. Congratulations, you’re an ant assassin! This method is great because these few ingredients for ant poison and bait are available at most grocery stores and may already be lying around in your kitchen cabinets or garage. There’s another mixture that pulls from the above recipe that you can also use for ant pest control in Queen Creek. Mix grape jelly, a small can of wet cat food (patte is easiest to mix), and boric acid together and place bits of the mixture around foraging ants and wherever you see a lot of them. Like the above recipe, this recipe will be taken back to the queen and the whole nest of ants that are plaguing your home should be exterminated within a few days. Be sure that when the ants are gone, if there is any mixture remaining, clean it up. The meat in the catfood can get pretty gross after a while if left out. In most cases, the ants will be so excited about your home-cooked meal that all of it will be eaten or taken back to the nest. Ants love anything edible, but there are some things they’re picky about. Picky enough to leave and never come back when these materials and spices are present. Try mixing dried mint, cayenne pepper, powdered cinnamon, alfalfa meal (organic if possible), rock dust, a pack of dry enchilada sauce mix, and garlic powder together into a powdery, nose-burning mixture. Be careful to keep the mixture away from your eyes! Consider wearing goggles if they are available. Find spots outside or around your home where you’re seeing a large concentration of ants and sprint the mixture around those areas. This mixture won’t kill the ants, but they’ll be so grossed out by it (like you probably will be too) that they will leave. Consider it a barrier for your home against ants. If you’re seeing a lot of ants around your patio area and are concerned about them getting into your house or ruining your outdoor activities, consider sprays the ants that you see with this do it yourself ant spray. Take two liters of water, a bit of natural castile soap, a couple tablespoons of soap flakes, a teaspoon of oil (preferably sesame oil), and some hot sauce and shake the mixture up in a spray bottle. Then spray away! This exterminator mixture kills ants instantly and sends a message to the nest to avoid the area. The above homemade recipes and do it yourself tips can work most of the time, but sometimes an ant infestation can be too powerful. If you’re up to your neck in ants and don’t know what to do, consider calling a professional exterminator or pest control company like Varsity Termite and Pest Control. The professionals know exactly what to do when it comes to challenging an ant (or other pest) infestation and getting rid of the nest and colony for good. Who can help me with my ant problem in Arizona? 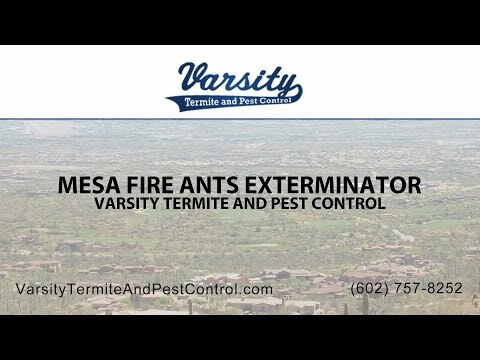 Varsity Termite and Pest Control is a local Mesa, Arizona pest control company that is ready and available to help you with your serious ant problem or other pest problem. When you need a thorough, professional, and quality-providing exterminator to protect your family or business from potentially dangerous pests or vermin, Varsity Termite and Pest Control is there to help. Family owned and operated for over twenty one years, we have the experience and expertise to take care of your pest problems. Give us a call today to schedule an appointment and get a quote.